Mustafa has been living on boats since he was a child and this shows as he seems to know every other seafarer we come across. It’s hard to mention Mustafa without also mentioning Zeynep his hard working wife. Together the 2 of them form a formidable team skippering our clients on our Turkish Lycian Way swims. They are warm and friendly and have a great strike record for spotting dolphins in the waters. 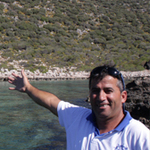 Mustafa has been skippering for SwimTrek in the Turkey since 2010.